"Skeena Valley" redirects here. For the electoral district, see Skeena—Bulkley Valley. The Skeena River is the second-longest river entirely within British Columbia, Canada (after the Fraser River). Since ancient times, the Skeena has been an important transportation artery, particularly for the Tsimshian and the Gitxsan—whose names mean "inside the Skeena River" and "people of the Skeena River," respectively. The river and its basin sustain a wide variety of fish, wildlife, and vegetation; and communities native to the area depend on the health of the river. The Tsimshian migrated to the Lower Skeena River, and the Gitxsan occupy territory of the Upper Skeena. During the Omineca Gold Rush, steamboat services ran from the sea to Hazelton, which was the jumping-off point for the trails to the goldfields. The Hudson's Bay Company established a major trading post on the Skeena at what became called Port Simpson, British Columbia (Lax Kw'alaams), where nine tribes of the Tsimshian nation settled about 1834. Other tribes live elsewhere in BC, and descendants of one group in Metlatkala, Alaska. 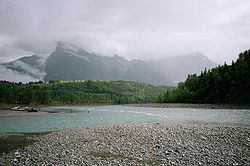 The Skeena originates south of the Spatsizi Plateau Wilderness Provincial Park in north western British Columbia, forming a divide with the Klappan River, a tributary of the Stikine River. It flows for 570 km (350 mi) before it empties into Chatham Sound, Telegraph Passage and Ogden Channel, east of the Dixon Entrance, all part of the Pacific Ocean. The Skeena drains 54,400 km2 (21,000 sq mi) of land with a mean annual discharge of 1,760 cubic metres per second (62,000 cu ft/s). The Skeena River originates at the southern end of Spatsizi Plateau, in a valley between Mount Gunanoot and Mount Thule, south of the Stikine River watershed. The abandoned track of BC Rail's Dease Lake Extension runs along the river in its upper course. It flows south-east, between the shallow peaks of the Skeena Mountains, through the McEvoy and Jackson flats. It continues in this direction until it passes the Slamgeesh Range, then flows westwards to Fourth Cabin, when it turns south through a shallow canyon below Poison Mountain. After Kuldo it takes an eastward turn, then flows south again below Cutoff Mountain and Mount Pope. It continues through rolling hills to the community of Kispiox and then Hazelton, where it receives the waters of Morice-Bulkley River, and turns south-west. The Yellowhead Highway and a Canadian National Railway track follow the course of the Skeena on this section. At Kitwanga, the river is crossed by Highway 37, and then turns south around the Seven Sisters Peaks and Bulkley Ranges, through the Skeena Provincial Forest, then between the Nass Ranges and Borden Glacier, past the ferry crossing at Usk, through the Kitselas Canyon, and then through the Kleanza Creek Provincial Park. It then flows south-west through the city of Terrace, where the river widens. It continues westwards, followed by the Highway 16 and Canadian National Railway line, passes near the Exchamsiks River Provincial Park, then flows into the Dixon Entrance at Eleanor Passage, between Port Edward and Port Essington, facing De Horsey Island. The Skeena supports a wide variety of fish and wildlife. The British Columbia Ministry of the Environment, through BC Parks, has designated a number of Ecological Reserves along the course of the river. The Skeena is well known for its sport fishing, most notably salmon. The Skeena is also very important to the commercial fishing industry. For example, numbering 5 million spawning salmon a year, the Skeena is second only to the Fraser River in Canada in its capacity to produce sockeye salmon. However, in the last 40 years there has been a decrease in some of the fish species, leading to strict fishing regulations for the commercial fishery. Chinook salmon, sometimes known as king, Tyee, spring, Quinnat, tule, or blackmouth salmon. Chum salmon, sometimes known as dog or calico salmon. Coho salmon, sometimes known as silver salmon. Pink salmon, sometimes known as humpback salmon. Sockeye salmon, sometimes known as red salmon or blueback salmon. The rare Kermode bear lives in and near the Skeena Valley from Prince Rupert to Hazelton. The region is also home to many black bears and brown bears. Grizzly bears are less common in the area but the Khutzeymateen Grizzly Bear Sanctuary is located nearby. The Skeena River watershed is the ancient homeland of the Tsimshian, Gitxsan, and Wet'suwet'en people. The Hudson's Bay Company's local headquarters were at Port Simpson, although Port Essington was also used extensively as a port for its sternwheelers. While canoes played a crucial role on the Skeena for centuries, the age of the steamboat heralded a new era of boating on the Skeena. The first steam-powered vessel to enter the Skeena was the Union in 1864. In 1866 the Mumford attempted to ascend the river but was only able to reach the Kitsumkalum River. It was not until 1891 that the Hudson's Bay Company sternwheeler the Caledonia successfully negotiated through the Kitselas Canyon and reached Hazelton. A number of other steamers were built around the turn of the century, in part due to the growing fish industry and the gold rush. Wikimedia Commons has media related to Skeena River. ^ "Skeena River". BC Geographical Names. ^ a b c d Benke, Arthur C.; Cushing, Colbert E. (2009). Field Guide to Rivers of North America. Academic Press. pp. 330–331. ISBN 978-0-12-378577-0. Retrieved 5 August 2013. ^ British Columbia.com. "Skeena River". Retrieved 2008-01-23. ^ Skeena River Ecological Reserve .